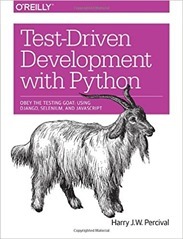 Test-Driven Development with Python by Harry J.W. Percival is a tutorial rather than a text book and it taught me as much about Django as testing. I should point out that I wilfully fail to do the “follow along with me” thing in tutorial style books. Test-driven development (TDD) is a methodology that mandates writing tests first before actual code that does stuff. The first tests are for the desired behaviour that will be presented to the user. I was introduced to software testing very early in my tenure ScraperWiki, now The Sensible Code Company. I was aware of its existence prior to this but didn’t really get the required impetuous to get me started, it didn’t help that I was mostly coding in Matlab which didn’t have a great deal of support for testing at the time. The required impetus at ScraperWiki was pair programming. Python is different to Matlab, it has an entirely acceptable testing framework built-in. Test-driven Development made me look at this functionality again. So far I’ve been using the nose testing library but there is a note on its home page now saying it will not be developed further. It turns out Python’s unittest has been developing in Python 3 which reduces the need for 3rd party libraries to help in the testing process. Python now includes the Mock library which provides functions to act as “test doubles” prior to the implementation of the real thing. As an aside I learnt there is a whole set of such tests doubles including mocks, but also stubs, fakes and spies. The solution is worked through using the Django web framework for Python. I’ve not used it before – I use the rather simpler Flask library. I can see that Django contains more functionality but it is at the cost of more complexity. In places it wasn’t clear whether the book was talking about general testing functionality or some feature of the Django testing functionality. Django includes a range of fancy features alien to the seasoned Flask user. These include its own ORM, user administration systems, and classes to represent web forms. Devops still seems to be something of a dark art with a provision of libraries and systems (Chef, Puppet, Ansible, Juju, Salt, etc etc) with no clear, stable frontrunner. An appendix introduces “behaviour-driven development” which sees sees a test framework which allows the tests to be presented in terms of a domain specific language with (manual) links to the functional tests beneath. With the proviso above, that I don’t actually follow along, I like the tutorial style. Documentation has its place but ultimately it is good to be guided in what you should do rather than all the things you could possibly do. Test-driven Development introduces the tools and vocabulary you need to work in a test-driven style with the thread of the list management web application tying everything together. Whether it instils in me the strict discipline of always writing tests first remains to be seen.